Some folks go to Hollywood to ogle the stars on the Walk of Fame, but I had a bigger mission a few weekends ago, to attend an industry dinner with the cast and crew of "Get Smart" and meet friends I've never met face to face. For those of you who've forgotten or never seen the show, "Get Smart" (1965-1970) was a spy spoof that put every sacred cow of the day out to pasture. Created by Mel Brooks and Buck Henry, bureaucracy was the chief whipping boy. Former stand-up comedian Don Adams starred as Maxwell Smart, a bumbling, but well-meaning spy. His partner was the beautiful and brainy Agent 99, played by the velvet-voiced Barbara Feldon. The two worked for an organization named Control that kept enemy spy outfit Kaos at bay. Despite infrequent syndication, the show's fans would not let gadgets like the shoe phone and cone of silence be forgotten. In 1995, an Internet list serve was organized by Carl Birkmeyer of Baltimore, known to our group as the "Chief." In those eight years, the list serve united "Smartians" from across the globe. "The Get Smart Gathering" was born last year when Birkmeyer, Web master of "Get Smart's" biggest online fan base, www.wouldyoubelieve.com, decided it was time to let the show's creative talents know they were appreciated. Two fans who knew the industry assisted Birkmeyer in his mission. Alan Spencer, creator of the TV series "Sledge Hammer!," helped line up the dinner at Barsac Brasserie, noted for feeding the likes of Steven Spielberg. Sue Kesler, a film editor of NBC's "American Dreams," put in a metric ton of work by locating the cast and persuading them to come. Held Nov. 7, the "Get Smart Gathering" was not a convention with vendors selling comic books and fan boys pleading for autographs. It was a swanky Hollywood event. More so, it was a cast reunion, as some of the cast and crew had not seen each other since "Get Smart" was canceled. Seats were assigned by lot, and I was lucky enough to be seated across from Don Adams and next to the show's producer, Leonard Stern, and his wife Gloria. Stern wrote for "The Honeymooners," helped create "Mad Libs" and "Get Smart's" memorable opening-door sequence. The cast and crew were the nicest people. They were touched that we cared about their work and traveled across the country to be there. "You came all the way from Indiana?" Don Adams asked me. That was nothing. In addition to another Hoosier, one girl came from England, three men flew over from Australia and another fan came from China. Table conversation often was not about the show. The occupants at Feldon's table discussed Shakespeare, the classics and their favorite novels. Adams was intrigued by how fans who had never met could talk to each other like they had grown up together. 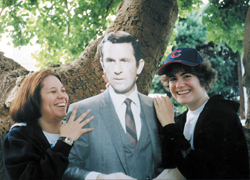 Amanda Haverstick (right) poses with fellow Get Smart fan Lisa Stiles, of Arizona, next to a cardboard cutout of Maxwell Smart. The Internet, since its inception, has been just that kind of unique anomaly. It's a world of screen names and typeface, but there are times like this when chatters become quite close. The "Get Smart Gathering" concluded Saturday afternoon with a picnic at Roxbury Park in Beverly Hills. Kesler brought her fire-engine red Sunbeam -- an exact replica of the car Maxwell Smart drove -- for pictures and a spin. Fans also could have their picture taken with a cardboard Maxwell Smart which, true to form, kept falling face first in the dirt. Mostly, we spent the time chatting about our favorite episodes, the dinner and how we came to love "Get Smart." One fan, Brian of New Jersey, said the show helped him get through a tough year. In 2001, his father died, his mother had a heart attack and he found himself having to leave his bachelor pad to move in with his mother and grandmother. A full-time businessman and Emergency Medical Technician, he often traveled into New York City. On the morning of Sept. 11, 2001, he went into the city to work his business job, but was needed and worked as an EMT. He arrived just in time to see the first of the Twin Towers collapse as a result of terrorist attacks. Brian wound up in the doctor's office, where he was prescribed two episodes of "Get Smart" a day, one in the morning and one at night. His doctor even gave him 48 hours worth of episodes. After the picnic, a carload of us were driving through Century City. Someone mentioned we passed what looked like a red-carpet premiere. My cyber friend at the wheel, Amanda of Los Angeles, pointed out it would never eclipse Friday's dinner party. "We had an event," she said. Click on your browser's "Back" button to go back.